Nancy Williams first visited Kauai in 1992 and knew from that very first visit that she would live on Kauai. Over the next 20 years Nancy returned to Kauai again and again, until finally (and happily!) moving to Kauai in 2012. After successfully launching the first on-line honeymoon registry company, HoneyLuna.com in 1996, and successfully pioneering this new industry for 12 years Nancy sold her company and spent the next 7 years in Business Development for a technology company. Nancy’s experience running her own company, selling technology and servicing her clients in the hospitality industry instilled in her a deep since of responsibility for her clients. She is applying these business skills in her real estate career. In addition, Nancy’s entrepreneurial spirit, her outgoing personality and her passion for the island of Kauai make her a great advocate and resource for those looking to move to Kauai, as well as for those already living on Kauai but looking for a new home. Nancy is a photographer, a SCUBA Dive Master, avid hiker, a competitive outrigger canoe paddler for the Hanalei Canoe Club, gardener and aspiring surfer. These passions and activities give Nancy a great appreciation for all that Kauai has to offer. Living on Kauai is Nancy’s dream come true. 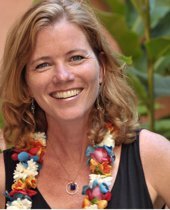 She is excited to share her passion for Kauai, her insights, and her knowledge of Kauai with her clients.